The world-famous Revolving Dining Room in the Skylon Tower Niagara Falls offers visitors the very best in Niagara Falls fine dining from the most unique dining location in Niagara Falls, at the top of the tower. 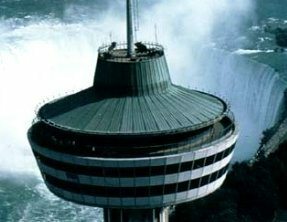 Welcome to the world-famous Skylon Tower Niagara Falls located in the heart of the Niagara Falls hotel, dining and entertainment district. Situated just steps from the Falls and across from Fallsview Casino the Skylon Tower offers visitors the very best in Niagara Falls fine dining from the most unique dining location in Niagara Falls. The Skylon Tower restaurant is situated at the top of the tower and revolves silently 360 degrees each hour and is the perfect location for a romantic dinner, family vacation or celebrating a special event. Dining in the evening provides you with a one of a kind view as the Falls are illuminated in an array of colours.